When we speak of using the Law of Attraction to manifest what our heart desires, and it actually does become a reality, it feels like magic. That you could think of something and make it come into existence for you does seem like it would require great effort and mysterious mantras. At least that is the conditioning we seem to function from thanks to our general upbringing. No one ever said that if you want something ask for it and it will be there. Our parents and teachers always said that we would have to work hard if we wanted a good life. Without paying your dues you could not expect anything to go your way, as per them. Then along comes this brand new concept that tells you that all you want can truly be yours. In fact you will not need to work terribly hard and slave away to get what you desire. All you need to do is think clearly about your desire and then visualize it as real. Work on the guidance given to you by your higher self, which is basically your connection to the eternal energy flowing throughout the universe. In due course you will find that whatever you have desired is coming straight to you. However there is one main barrier to making the Law of Attraction work for you. This is a low self esteem that believes that you do not deserve what you desire. Your self esteem intrudes in all aspects of your life. It affects the way you look because self esteem dictates how you dress and hold yourself. It pokes its head into your relationships as you either accept what adoration you get as your due, or wonder what the people’s hidden agenda is when they are being good to you. It also has far reaching consequences on your health because if you don’ think you are worth it; you are not going to make the effort to take care of yourself. It affects your financial security as well. All in all self esteem issues are best tackled head on to ensure that you live a better, more fulfilled life. One of the easiest ways to boost your self esteem is to do what Louise Hay terms “Mirror Work.” This essentially comprises of looking into your own eyes in a mirror and really seeing yourself. Then you add an affirmation that allows you to raise your self esteem. The one that Louise uses personally in tough situations is “All is well. Everything is working out for my highest good. I am loving and approving of myself. A solution is available. I feel better and better about my ability to deal with this challenge right now.” You can use this as a starting point and come up with any affirmation that works for you. Boosting your self esteem will help you trust your inner guidance better. It will allow you to gain confidence in your own abilities and talents. You will be more aware of the gifts your soul has to offer and be willing to share them with other people. There will be more love in your life and your relationships will have a grounding of compassion. It’s all possible if you believe you can do it. That is what the Heal Your Life Workshops are all about. Exploring what is lacking in yourself and healing it to help you develop into a more complete spiritual being. I have always wondered who the Divine masculine is. Is the Divine Masculine a human or a super human maybe someone like Superman or something else? Only to find out that this divine masculine is not a person but energy inside of me. This energy of the divine masculine complements the energy of the divine feminine in me. For bringing about a balance within myself I worked with the feminine aspect of me. That was easy as I also embody the feminine as a gender. But when it came to working with the masculine aspect in me, I realised that I had picked up conditioning of the corrupt masculine from many males in my life. This included my Grandfather, my father, my brother, my husband, male colleagues, women with the corrupt masculine; the list was endless. All the while I was displaying the shadow aspects of the masculine. Rather I was living in denial. It was then that the Divine Masculine opened up to me. The Divine Masculine plays the role of the banks of my divine feminine River. Without the banks the creative feminine will flow all over without any direction without any purpose. So the Divine masculine represents “TAPAS” which is Practise. It also represents a sense of direction, movement, action, responsibility, focus, encouragement, abundance, clarity, intellect and much more. So the Feminine is creating and birthing the new projects and dreams while the Masculine is supporting this birth by co-creating with Her. Thus, the new earth is a co-creation that depends on divine feminine and divine masculine both coming into its full respective power. This Masculine energy inside of us women is deeply wounded as it carries the scars of the patriarchal society. Healing these wounds is essential for evoking the divine masculinity in us. For years the masculine has been in power that represses others, atrocities, wars, hiding their emotions, disconnected with Source.This sort of constant denial of the true self has led to learned behavioural traits and habits that are extremely hard to break. They produce a lot of anger, resentment, frustration, discontent, and self-loathing that often comes when one routinely fails to honour their authentic self. So Balancing and coming in touch with our Divine Masculine archetype is very essential on our journey of becoming WHOLE. To learn more on your own inner tyrant masculine and invoke the essence of the divine masculine please participate in the Webinar on Conscious Femininity and Sacred Feminine by International Teacher Vera Feria Leal. Register Now…Limited Seats For Women Only. One of the most pertinent questions is also one of the most difficult to answer. If you say I am Asha. That is but a name, easily given to any new born babe. If you say I am a daughter, a sister, a wife, and a mother, it is a relation by force of birth or through norms of society. It is like millions of other relations shared by people all over the world. If you say I am a human being, that is a biological fact but there are so many other billion human beings on the planet, so how are you different? What makes you who you are? What can you achieve? And why does answering all these questions matter? The truth is that there is no easy answer to this question or any other deeply probing enquiry into your existence. Philosophers have spent lifetimes debating the true answer to this question, but if you are anything like most normal people, you don’t have so much time to waste. If you want to find out who you are, figure out your basic strengths and weaknesses. Figure out what you can do as opposed to what you are too scared to take on. Discover the core of yourself in your actions, both past and future. Find out if you like the person that your actions deem you to be and decide if there is anything that you would change if you could. One easy way to find out more about yourself is to have a mentor guide you through the steps. Just as someone who has walked a forest track before you will make a good guide, a person who has been on the path to self discovery and made more progress then you, can become your guide in this journey of self exploration. If you can follow the guide and move along faster on your way, it makes sense to find one rather than struggle unnecessarily for ages to get the same results. This is why people attend workshops on self development. They are not really developing themselves as much as discovering what potential they already possess within themselves. There are all kinds of things that you can discover about yourself, but honestly speaking not all parts of you are interesting enough to dig through. You have to decide on what aspects of yourself you are going to work on. Usually this would include specific setbacks that you are currently facing and finding ways to remedy them. Having a goal in mind will also help in enhancing your journey of self discovery. Explore what parts of your life you want to improve, and then link them to the parts of yourself that you have to work on. Move past surviving each day in a passive manner to actively living your life the way you want to. Attending a Heal Your Life Workshop with the Rainbow Lightworkers would be a great way to start. Webinar is essentially short for Web Seminar. The topic of the seminar could be related to anything and it could involve a presentation, lecture, or workshop that is transmitted over the web. Essentially speaking it a learning opportunity where an expert is able to connect with you via the internet. Just as you attend a seminar in person in a conference hall, you can attend a Webinar in the comfort of your home. It is just like attending a class, however here you are not physically seated with your teacher in the same room. Although just like how you speak on the telephone with a person and can gain their insights and energy, you are able to do the same when attending a Webinar. All you need is a computer with an active internet connection and multimedia capabilities. This means that you need to be online when the Expert or Teacher is going to speak, along with a working mike and speakers in order to listen to what is being said and asking any questions you have. You will also have to go to a specific website page in order to log into the Webinar. This is usually a Web Conferencing Software that allows multiple participants to attend the event. Most webinars involve the speaker talking on a subject for a fixed period of time before throwing the floor open to questions from the participants. These specific questions are then answered. Why Should I Attend One? For the same reason why you would attend a Seminar or a Workshop. The teaching that occurs in a Webinar may happen in the comfort of your own home, but that does not make it any less effective. Ask anyone who has taken a course online and you will be told that not only was it a convenient way to learn, it was also highly effective. Most Webinars are recorded and can be re-seen as videos later on. This allows you the opportunity to go over whatever was taught many times later on. You can watch the video to clear your doubts, or simply for the pleasure to hearing everything again. Since repetition is the best way to reinforce learning, watching the video repeatedly and catching new nuances each time to what was taught, just makes your knowledge expand. There are many reasons why people attend Webinars. The most important reason would be that financially it is far more affordable to take a Webinar than to physically go to a special place in order to attend a lecture by an expert on the topic you are interested in. The second is logistically it is much easier to get a large group together online than it is to cram them all into a single room in a building. Another reason is that the material for a Webinar is easily available to you on your personal computer anytime you wish to access it even after the lecture is over. 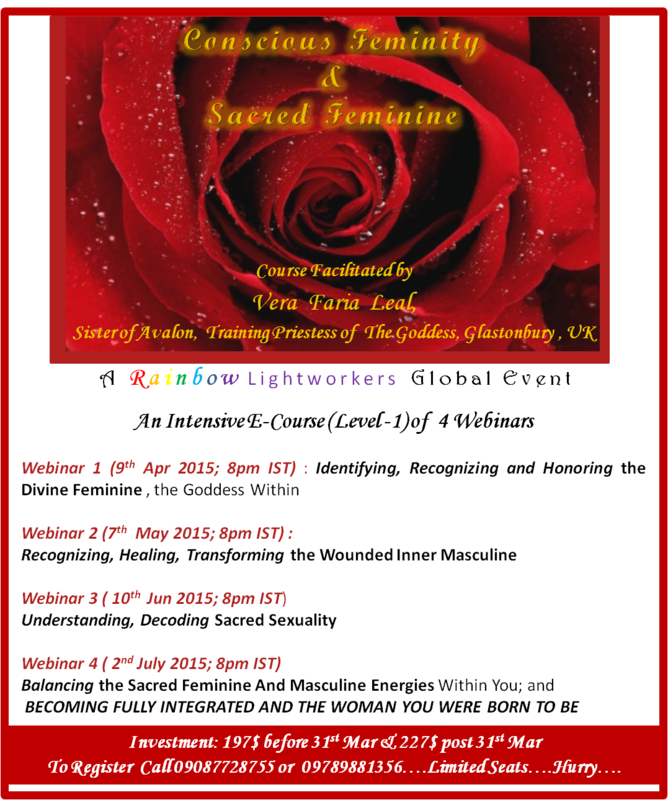 If you are looking to attend a Webinar as a new learning experience you may like to sign up for the Rainbow Lightworkers upcoming global event… Conscious Feminity and Sacred Feminine. Vera Faria Leal, and international Heal Your Life Trainer and Workshop facilitator will be hosting the event that allows you to get in touch with your Inner Goddess, understand yourself better and help you balance your life to get the best out of it. Register for the Webinar before 31st March and avail of the special $197 price. For more details of the four sessions going to be conducted and any other questions you may have please call 09087728755 or 09789881356. I begin from the point that you are indeed, already Powerful. So who is this Powerful woman? I ask you to take a mirror and take a good deep look at yourself. You see what your physical eyes see. A beautiful face, amazing skin, lovely set of eyes and those luscious lips to die for. You then look deeper into your eyes. Now you see a different you. Questions arise in your mind WHO AM I? And lo and Behold you are able to SEE HER…. SHE is empowered. She moves through her Life with Grace and Confidence. She is Happy to live her Purpose. She is busy scripting her life. She decides on the traits for her character – strong, assertive, determined, honest, competent, inspirational and lives that role purposefully. She is Haughty and Naughty and sweet and kind too. She moves out of Blame and makes her own choices. She is open to learning more about herself. She is open to the wisdom her Body brings to her. She is Fearless and at times drowned in fears. She has learnt to Respond to Anger as against Reacting. She knows to say NO when she doesn’t want to say YES. She feels the softness of her hands and the strength that they possess. She expresses her needs and desires. She is the one who lived her polarities. She has swayed for long from one end to the other. NOW she lives in BALANCE. And then YOU feel in your Heart … YES…YOU are indeed a Powerful Woman. Come join us for a Global Webinar on Conscious Feminine and Sacred Feminine presented by Teacher Vera Faria Leal to Discover that POWERFUL WOMAN in YOU.